What happens when you post an image challenging traditional notions of Queen Esther, calling her an assimilated Jew in an interfaith marriage? Turns out, you learn a lot about Jewish innovation. That is an ideal situation for me, as director of Innovation for the Pluralistic Rabbinical Seminary, an online rabbinical ordination program. I had meant to share “friends only”. Instead, I made it public on accident. The results surprised me. In a matter of hours, the post had over 200 reactions, 120 shares and endless comments. This is more social media chatter than all of the pages on the PRS website combined. I turned off notifications because I could not handle the distraction of apps trying to provide me social validation. 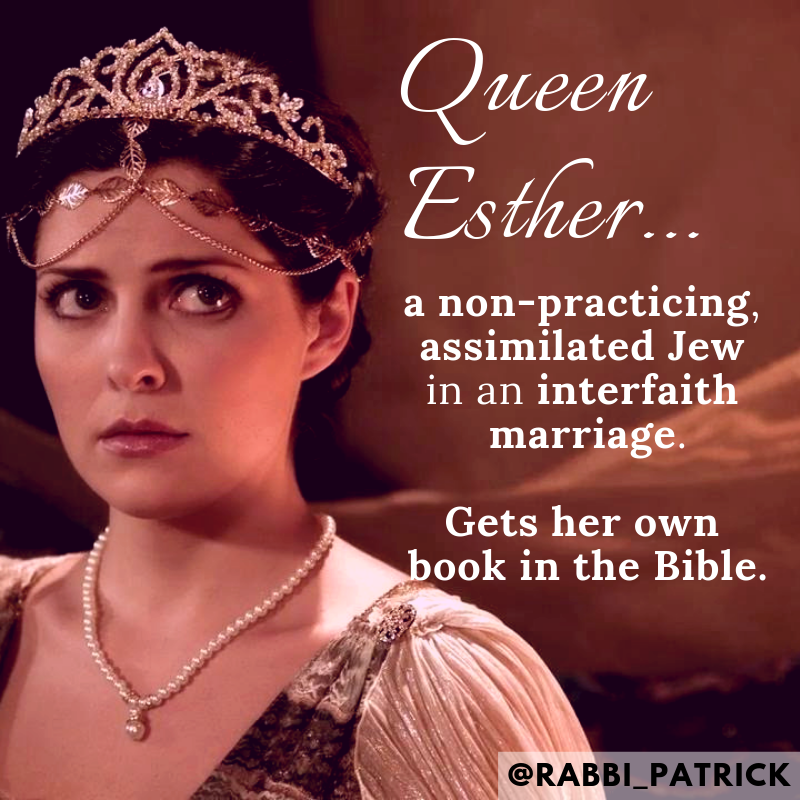 The image does not reflect on the vast amount of midrash and commentary on Esther which directly challenge my “insta drash” that Queen Esther was an assimilated Jew, did not keep kosher, or the nature of her marriage to the king. I get that. It was not meant to be Rashi or Rambam. It was meant to be a fun way to goof with my friends. The bigger question to me is why my post sparked so much attention? And what does this say about the need for Jewish innovation? What If Your Shul Purim Party Invite Went Viral? At the same time that Instagram Esther was having her five minutes of fame, countless synagogues and JCCs were promoting their Purim parties. I think it is fair to say that most Purim parties in America do not get 120+ Facebook shares. What if someone was teaching future synagogue leaders how to make simple, straight forward messages that do, in fact, promote that local Purim party, that struggling Hebrew school, that Orthodox havurah that is living on the edge? This for us is a question of great moral importance and something we plan to do at Pluralistic Rabbinical Seminary. In guiding students through the business, marketing, branding and technology of today’s rabbinate and the future, we are able to make Judaism and Jewish community go viral. For many of the people who liked the Esther image, the take away message was “I, as a bad Jew, belong within the Jewish peoplehood.” That was not where I was going with the post, but I am glad that people internalized a message that I indeed believe in. Of the one hundred shares I skimmed over, only three or four came from naysayers. The most valuable part of being told you are wrong is seeing who is against you and what their motivation is. The self-proclaimed “bad Jews” for whom my accidental message resonated would likely think the naysayers are Orthodox Jews. On the contrary, the funniest thing about that post is that its ire came from klal Yisroel! The two angry viewers who shot back first were an Orthodox Jew and a Reform Jewish educator. I mean not to be glib when I say that if we can get liberal Reform Jews and Modern Orthodox Jews to agree on something, even if it’s in agreement that I have no idea what I am talking about, then perhaps we are having a shehechianu moment! Pluralism is not another word for Liberals Only. Pluralism means everyone. That is why our program has Orthodox, Conservative, Reform and Post-Denominational rabbis and educators, as well as mentors. Pluralism means everyone is equally uncomfortable, equally challenged, and equally moved. I pray that PRS be that kind of program. We certainly are striving for that. Is there anyone who thinks less of me for my Facebook post? Likely. The internet is not dayan ha’emet (the True Judge), but it can feel that way! For many in the Jewish nonprofit world, as much as innovation is the parlance, it is a difficult value to live or goal to achieve. Some organizations live and thrive on inertia. Some ships are impossible to steer, even if only by a few degrees. Innovation for these organizations is met with an immediate pro/con list. What do we lose by thinking about the future? What happens is we fail? Or perhaps, what will people think of us if we go in the right direction, but perhaps not the direction people expect, and not right now? This is a Judaism that wants to avoid unintended consequences. It it not actually that forward thinking because it lives in a constant state of fear. It tends to look at the present and not the future. Fair enough! It’s hard to innovate for the future if you cannot keep the lights on in the present. Now for the next question: does it matter that some people might think less of me over a Facebook post? No, not at all. What we need more than ever is fearlessness. That is not to say that PRS has the monopoly on creating fearless leaders, or that there is no bravery in the rabbinic world. How do I know that is not the case? Because we needed to hire rabbis, and we chose fearless ones! What if we can begin rabbinic education with the premise that there is no job waiting for you, no movement to take care of you, no safety net to catch you when you fall? If we could challenge our students to rise up to the “hineini moment” of knowing that the future of Jewish innovation will be filled with surprises, obstacles, uncertainty, that what they must have as leaders is not the perfect resume for the idealized job (fewer and farther between even as it is), but provide the tools to build their own livelihoods, their own amazing Jewish projects that address tikkun olam, Jewish communal needs, synagogue affiliation and cultural relevance? Bottom line: PRS wants to find and ordain the kinds of students who would not only create something like my Insta Esther, but would do it far better than I, far more intentional than I, and bring about a better Jewish world as a result of it. All this, without fear. If any of this resonates with you, I hope you’ll join us at PRS. You are just the person we have been waiting for. Rabbi Patrick Beaulier is the director of the Innovation Program at Pluralistic Rabbinical Seminary. The above Instagram post used in the blog post is not a reflection of PRS, its educators, students or administrative team.